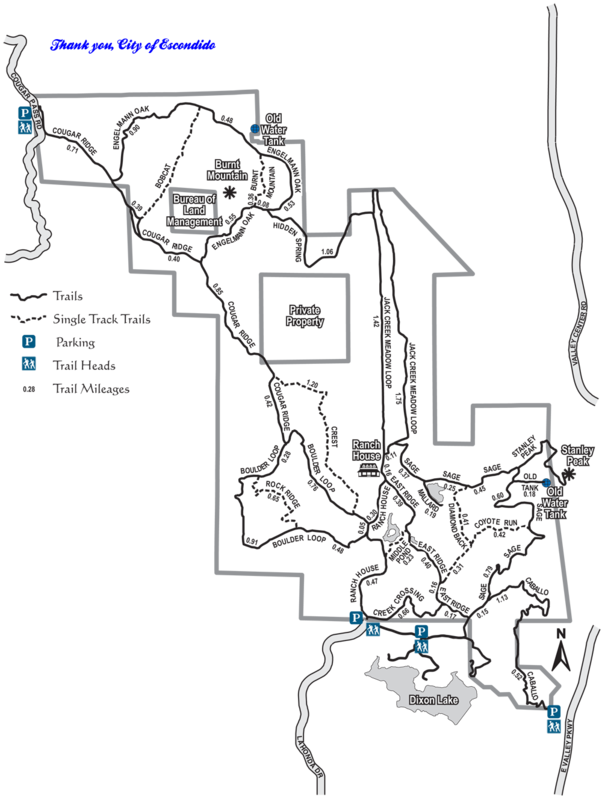 Length of Trail: Over 20 miles of trails in the 3,000 acre property. Staging Area: The main entrance is at the southernmost part of the property, just north of Lake Dixon at the top of La Honda Drive. The entrance to the northernmost part of the property is along Cougar Pass Road, 0.5 mile south of Alps Way. Cougar Pass Road is a dirt road, but suitable for normal vehicles. Coming from Escondido, go north on Broadway to Cougar Pass Road. Coming from Fallbrook, take the Deer Springs/Mountain Meadow exit on I-15, go east along Mountain Meadow Road and Mountain Glen Way to Cougar Pass Road. There is also ample parking for equestrian trailers at the Valley Center Road entrance. From Valley Center, Take Valley Center Road south approximately ¼ mile and turn right at the Dixon Lake Filtration Plant access road. For more information, contact the Dixon Lake Ranger Station at (760) 839-4680. Water: There is seasonal water on the trails. Trail Conditions: Easy to challenging. It is very popular on weekends. 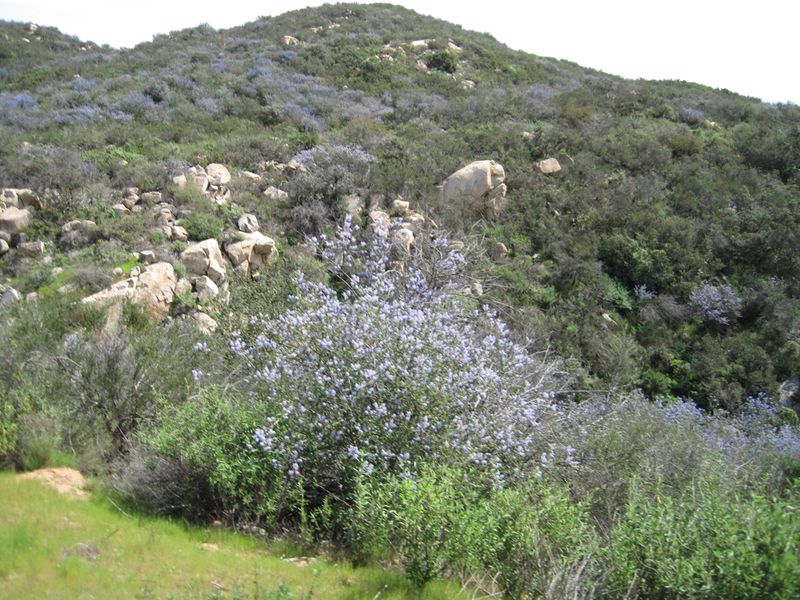 There are some steep trails, including Boulder Loop and Hidden Spring Trail. Burnt Mountain trail is a single track trail and is rocky. Trail Users: The trail is open to hikers, cyclists, as well as horseback riders. Trail Descriptions: Mountain Bike Bill has great trail descriptions of Creek Crossing, Jack Meadow Loop, Boulder Loop, Rock Ridge, Cougar Ridge, Engelman Oak Loop and Bobcat Trail. You can also download a topo map from this site. 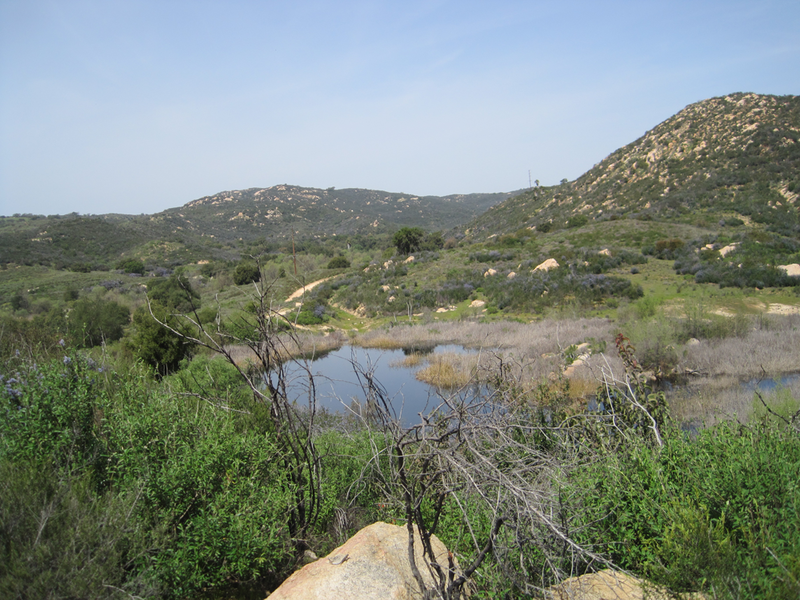 General Trail Info: “The Daley Ranch is a 3,044 acre property in the hills of northeastern Escondido that will be preserved as open space forever. 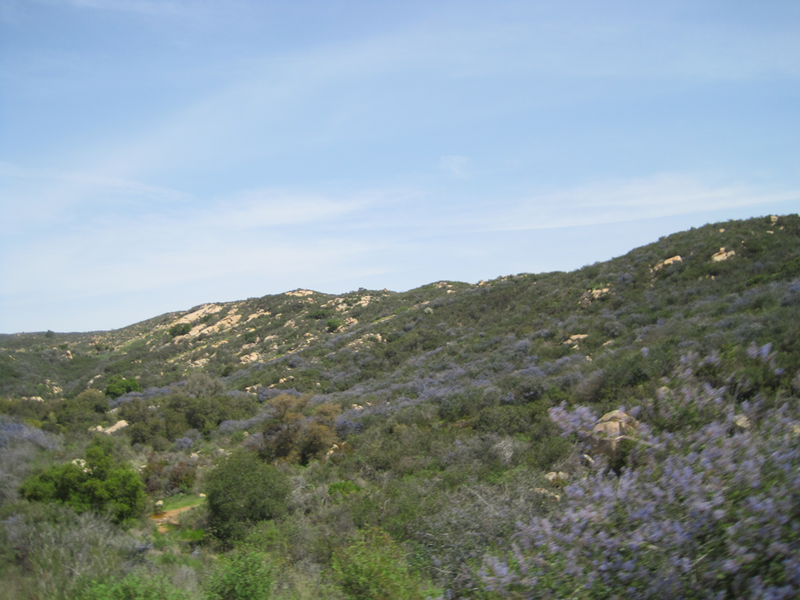 It comprises essentially the entire northern part of Escondido, everything above Dixon Reservoir with two small excepted enclaves, one-seventh the entire land mass of Escondido! Recreational uses such as hiking, biking and horse riding will be allowed. 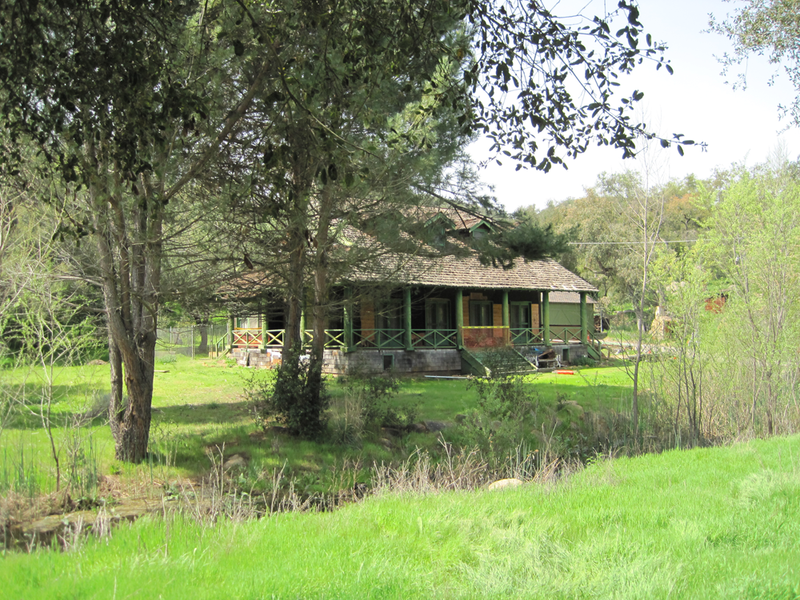 "Daley Ranch has more than 20 miles of multiuse (hiking, biking and horse riding) trails, as well as a rustic ranch house built in 1927. 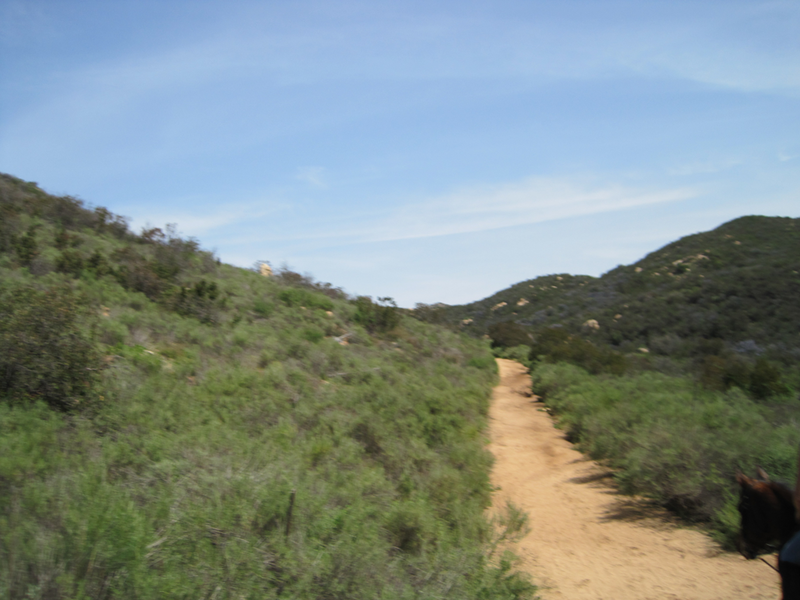 There are 7 trails, from the 1.4 mile Caballo Trail to the 5.5 mile Central Valley Loop Trail. A loop around the entire property is 12.2 miles on my bicycle odometer and took me 3 hours. Including an excursion to the Dixon Lake refreshment stand makes the trip 13.8 miles with a total time of just under 4 hours. 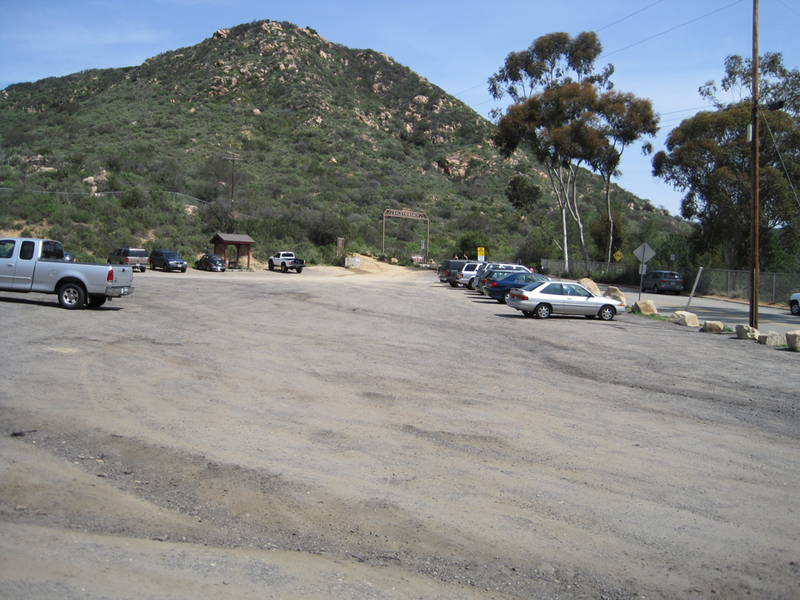 A trail map is available at both entrances, as well as at Dixon Lake, although they have been out at the northwestern entrance at times."